My ultimate bucket list item when I visited British Columbia? Hike to the bottom of Brandywine Falls, as the last time I visited, I couldn’t figure it out. There are a few blog posts out there that explain how to get to the bottom of Brandywine Falls, so I read through those. However, there were points along the hike where I confusedly paused to see where to head next. I did this hike solo, so getting wildly lost wasn’t an option. When I hiked back to the top of Brandywine, to the lookout points, I realized how insanely easy and short this hike was and that I had taken the long way down. The fence ends here, and it’s where the trail begins. The trail here is well-trodden and easy to follow. You’ll soon come across a rocky slope. 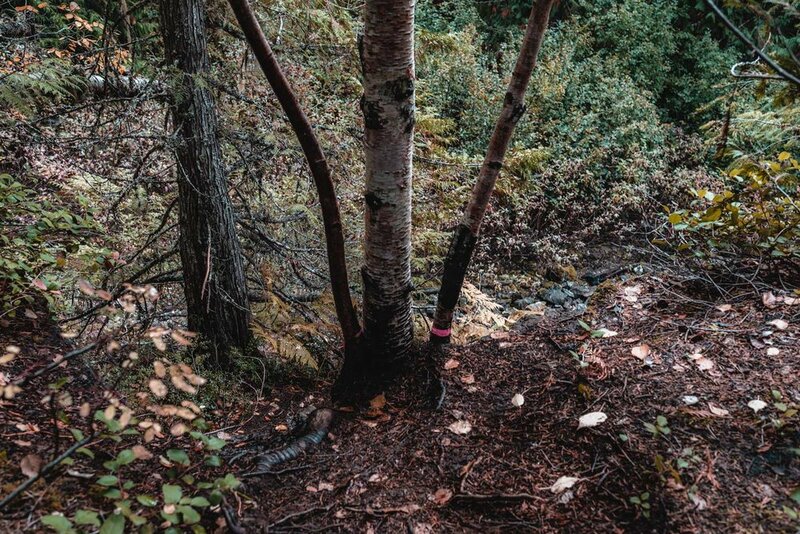 After hiking down, look for pink or orange ribbons tied around tree branches or trunks. I’m not sure what the difference is between the two colours, but throughout the hike, as long as I saw either ribbon, I knew I was on the right path. You’ll eventually come across a tree with two pink ribbons tied around its base. Hike down, past this tree. This is where I got confused. To your left, there will be a well-trodden dirt path (red arrow) and to your right are a bunch of rocks (yellow arrow). Naturally I assumed the dirt path was supposed to be taken and went that way. There was an opening. To your right will be another opening and if you walk past the trees and logs, there will be huge stone ‘steps’, which I climbed down. This is the long way down, and I don’t recommend it, as there are a bunch of tree branches and logs in your way, making it difficult to get across. If you follow the yellow arrow and hike down the rocks, you’ll come across an opening at the bottom. Keep walking towards your right, you’ll eventually start seeing ribbons again. Once you spot this opening in the forest, you’re almost there. Hike in the direction against the river current — there’s no getting lost at this point. The rushing waterfall can loudly be heard. Brandywine Falls is glorious up close. You can walk as close to it as you want, but you will get wet! The hike is worth it, and it’s one of my favourite ones in BC! The hike back was easier. Follow the ribbons, climb the rocky slope and you’ll soon return to the opening with the tree with the two pink ribbons tied around its base. I’ve read on how other bloggers saw a rope that you can hold on to while climbing down. I never saw a rope during the hike, so there may me multiple ways to get to the bottom of Brandywine Falls. Why You Should Visit Valencia This Winter! Are Long Flights in Economy Class Really the Worst Thing?